Question The Status Quo, The Holy Cows – In Short “EVERYTHING”! 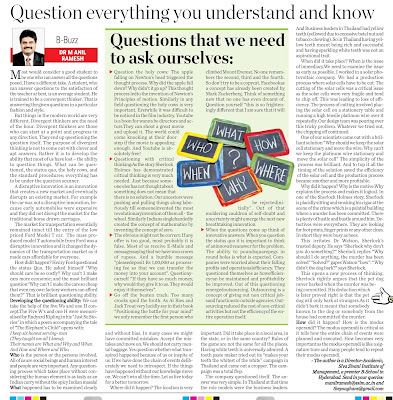 Most would consider a good student to be one who can answer all the questions posed. I have a different take. A student, who can answer questions to the satisfaction of the teacher at best, is an average student. He is trained to be a convergent thinker. That is answering the given questions in a particular fashion and style. But things in the modern world are very different. Divergent Thinkers are the need of the hour. Divergent Thinkers are those who can start at a point and progress in any direction. They end up questioning the question itself. The purpose of divergent thinking is not to come out with clever and apt answers. Rather it is to develop the ability that most of us have lost - the ability to question things. 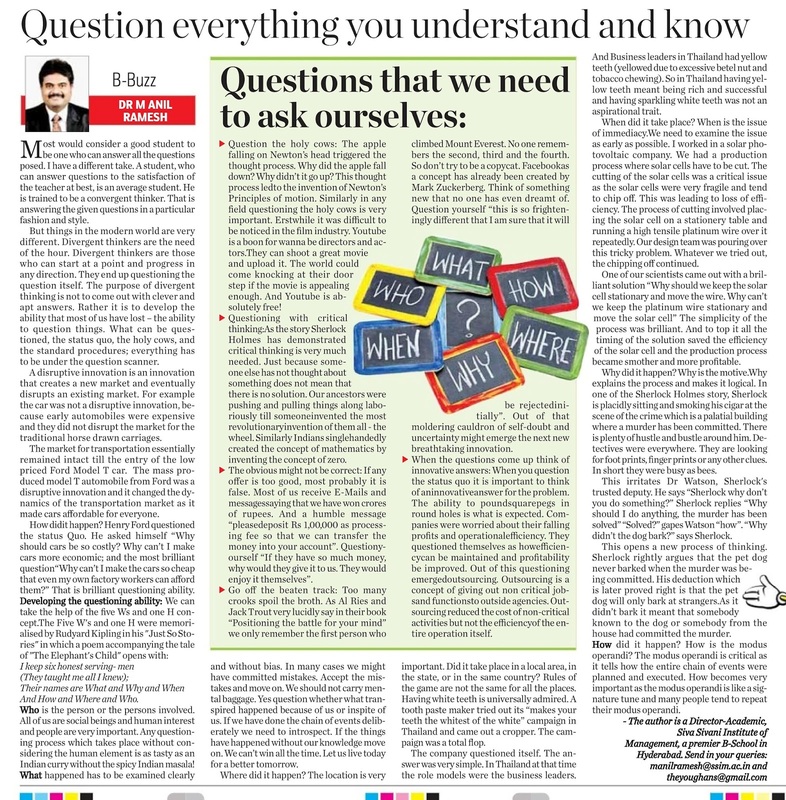 What can be questioned, the status quo, the holy cows, and the standard procedures; everything has to be under the question scanner. A disruptive innovation is an innovation that creates a new market and eventually disrupts an existing market. For example the car was not a disruptive innovation, because early automobiles were expensive and they did not disrupt the market for the traditional horse drawn carriages. The market for transportation essentially remained intact till the entry of the low priced Ford Model T car. The mass produced model T automobile from Ford was a disruptive innovation and it changed the dynamics of the transportation market as it made cars affordable for everyone. How did it happen? Henry Ford questioned the status Quo. He asked himself “Why should cars be so costly? Why can’t I make cars more economic (from this came the revolutionary assembly line production concept) and the most brilliant question “Why can’t I make the cars so cheap that even my own factory workers can afford them?” That is brilliant questioning ability. Who is the person or the persons involved. All of us are social beings and human interest and people are very important. Any questioning process which takes place without considering the human element is as tasty as an Indian curry without the spicy Indian masala! What happened has to be examined clearly and without bias. In many cases we might have committed mistakes. Accept the mistakes and move on. We should not carry mental baggage. Yes question whether what transpired happened because of us or inspite of us. If we have done the chain of events deliberately we need to introspect. If the things have happened without our knowledge move on. We can’t win all the time. Let us live today for a better tomorrow. Where did it happen? The location is very important. Did it take place in a local area, in the state, or in the same country? Rules of the game are not the same for all the places. Having white teeth is universally admired. A tooth paste maker tried out its “makes your teeth the whitest of the white” campaign in Thailand and came out a cropper. The campaign was a total flop. The company questioned itself. The answer was very simple. In Thailand at that time the role models were the business leaders. And Business leaders in Thailand had yellow teeth (yellowed due to excessive betel nut and tobacco chewing). So in Thailand having yellow teeth meant being rich and successful and having sparkling white teeth was not an aspirational trait. When did it take place? When is the issue of immediacy. We need to examine the issue as early as possible. I worked in a solar photovoltaic company. We had a production process where solar cells have to be cut. The cutting of the solar cells was a critical issue as the solar cells were very fragile and tend to chip off. This was leading to loss of efficiency. The process of cutting involved placing the solar cell on a stationery table and running a high tensile platinum wire over it repeatedly. Our design team was pouring over this tricky problem. Whatever we tried out, the chipping off continued. One of our scientists came out with a brilliant solution “Why should be keep the solar cell stationary and move the wire. Why can’t we keep the platinum wire stationary and move the solar cell” The simplicity of the process was brilliant. And to top it all the timing of the solution saved the efficiency of the solar cell and the production process became smother and more profitable. Why did it happen? Why is the motive. Why explains the process and makes it logical. In one of the Sherlock Holmes story, Sherlock is placidly sitting and smoking his cigar at the scene of the crime which is a palatial building where a murder has been committed. There is plenty of hustle and bustle around him. Detectives are everywhere. They are looking for foot prints, finger prints or any other clues. In short they are busy as bees. This irritates Dr. Watson, Sherlock's trusted deputy. He says “Sherlock why don’t you do something?” Sherlock replies “Why should I do anything, the murder has been solved” “Solved?” gapes Watson “how”. “Why didn’t the dog bark?” says Sherlock. This opens a new process of thinking. Sherlock rightly argues that the pet dog never barked when the murder was being committed. His deduction which is later proved right is that the pet dog will only bark at strangers. As it didn’t bark it meant that somebody known to the dog or somebody from the house had committed the murder. How did it happen? How is the modus operandi? The modus operandi is critical as it tells how the entire chain of events were planned and executed. How becomes very important as the modus operandi is like a signature tune and many people tend to repeat their modus operandi. 1. Question the holy cows: The apple falling on Newton’s head triggered the thought process. Why did the apple fall down? Why didn’t it go up? This thought process led to the invention of Newton’s Principles of motion. Similarly in any field questioning the holy cows is very important. Erstwhile it was difficult to be noticed in the film industry. Youtube is a boon for wanna be directors and actors. They can shoot a great movie and upload it. The world could come knocking at their door step if the movie is appealing enough. And Youtube is absolutely free! 2. Questioning with critical thinking: As the story Sherlock Holmes has demonstrated critical thinking is very much needed. Just because someone else has not thought about something does not mean that there is no solution. Our ancestors were pushing and pulling things along laboriously till someone invented the most revolutionary invention of them all - the wheel. Similarly Indians singlehandedly created the concept of mathematics by inventing the concept of zero. 3. The obvious might not be correct: If any offer is too good, most probably it is false. Most of us receive E-Mails and messages saying that we have won crores of rupees. And a humble message “please deposit Rs 1,00,000 as processing fee so that we can transfer the money into your account”. Question yourself “If they have so much money, why would they give it to us. They would enjoy it themselves”. 4. Go off the beaten track: Too many crooks spoil the broth. As Al Ries and Jack Trout very lucidly say in their book “Positioning the battle for your mind” we only remember the first person who climbed Mount Everest. No one remembers the second, third and the fourth. So don’t try to be a copycat. Facebook as a concept has already been created by Mark Zuckerberg. Think of something new that no one has even dreamt of. Question yourself “this is so frighteningly different that I am sure that it will be rejected initially”. Out of that moldering cauldron of self-doubt and uncertainty might emerge the next new breath taking innovation. 5. When the questions come up think of innovative answers: When you question the status quo it is important to think of an innovative answer for the problem. The ability to pound square pegs in round holes is what is expected. Companies were worried about their falling profits and operational efficiency. They questioned themselves as how efficiency can be maintained and profitability be improved. Out of this questioning emerged outsourcing. Outsourcing is a concept of giving out non critical jobs and functions to outside agencies. Outsourcing reduced the cost of non-critical activities but not the efficiency of the entire operation itself.